In2Eyes is a provider of Hybrid Contact Lenses: Hybrid contact lenses are the latest and most advanced option available in contact lenses specifically designed for keratoconus, astigmatism and irregular cornea patients. They have a combination of hard centre with a soft skirt for a much more comfortable fit and feel than either hard or soft contact lenses. 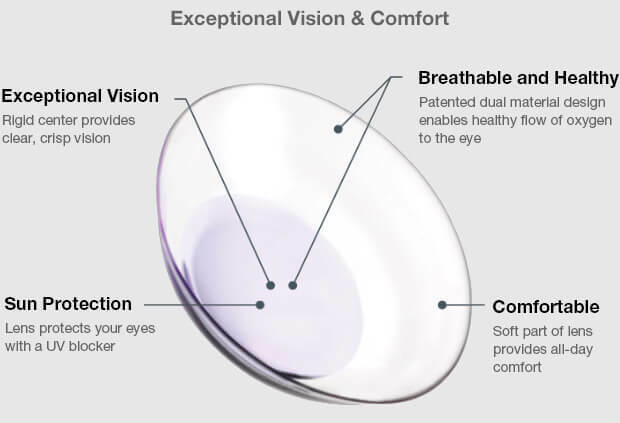 A hybrid contact lens combines a Gas Permeable (GP) or “hard” lens) centre with a soft skirt to give you the clear, crisp vision of a “hard” lens and the comfort and ease-of-wear of a soft lens. Hybrids combine the best of both worlds: the crisp vision of a high-oxygen rigid gas permeable (RGP) contact lens with the all-day comfort and convenience of a soft lens. Hybrid contact lenses are a better choice over soft contact lenses for patients who have Keratoconus, Astigmatism or Irregular Cornea as they can be tailored for the perfect fit to each individual. Hybrid contacts retain their shape better than soft contact lenses which results in crisper and more consistent vision. Hybrid contact lenses clean and disinfect easily, don’t dehydrate, are easier to handle, and last longer than soft lenses. They offer excellent eye health: because they don’t contain water like soft lenses do, they resist deposits and are less likely than soft contacts to harbor bacteria. Who Should Use Hybrid Contact Lenses? Hybrids are specifically designed to restore vision to patients with the many types and stages of keratoconus. At In2Eyes we take the time ensure you will be fully comfortable with contact lens preparation, cleaning and insertion. Your Hybrid Contact lens will be custom fit for your prescription as well as the shape and size of your eye. At In2Eyes, we use sophisticated machinery to map your eye topography which enables us to better align the back surface of the lens with the cornea. By measuring the exact shape of your cornea we can prescribe lenses with the curvature, size, and corrective power that suit your particular eyes. The two most common type of Hybrid lenses are Ultrahealth and Duette HD. Duette HD’s are available in single vision or multifocal designs. UltraHealth is the newest and most advanced hybrid contact lenses by SynergEyes especially suited for patients with keratoconus and other irregular cornea conditions. Now you can see life with crystal-clear vision, clarity and comfort. No more lenses popping out or shifting. No more irritating dirt. Just clear vision and comfort all day long. Crystal-Clear Vision. Experience the unparalleled vision benefits of hybrid contact lenses. The GP material optimizes sharpness of vision, while the soft silicone hydrogel periphery keeps the lens in place over the cornea, providing enhanced stability and clarity. All-Day Comfort. 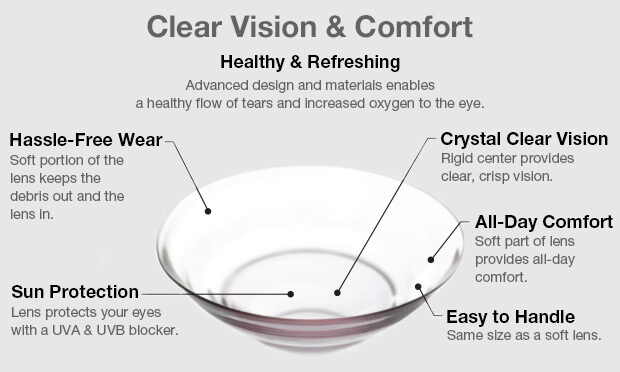 The soft part of the lens provides exceptional long-lasting comfort for irregular cornea and keratoconus patients. Healthy and Refreshing. The patented dual material (GP and silicone hydrogel) enables high oxygen transmission to your eyes and promotes tear circulation throughout the day, boosting the health of your eyes while delivering exceptional comfort. Duette® HD are the best contact lenses for astigmatism on the market today. They are a new, high-tech approach to achieving the best vision possible. Imagine walking outside and everything looks clearer and sharper than you’ve ever seen it before. That’s the idea behind Duette HD contact lenses. Duette® Progressive contact lenses deliver crisp, clear vision at all distances to let you focus on near objects, as well as enhancing intermediate and distance vision. With Duette Progressive, you can live focused…any time…any distance! Duette® Multifocal’s rigid center delivers crisp, clear vision that is not dependent on the position of the lens, so your vision stays consistently clear all day and into the night. All Duette® Contact lenses are a hybrid contact lens with a hard centre and soft skirt. They are made of highly breathable materials so your eyes get a steady stream of nourishing oxygen throughout the day to keep your eyes white, bright and healthy. Synergeyes have a lot of helpful information on their website as well as videos on hybrid contact lens care, insertion and removal. You can watch some of these videos below. Those who have been looking to treat their keratoconus in Melbourne can turn to In2Eyes for our hybrid lenses, or to enquire about potential surgical options. Keratoconus is primarily treated with contact lenses because glasses cannot visually correct the irregular form of the cornea. Hybrid lenses are an ideal option for keratoconus, as the lens design vaults over the cornea, so there’s minimal risk of corneal scarring. In addition, the soft skirt of the hybrid design helps to centre the contact lens over the visual axis regardless of where the cone is located on the cornea or how large it is, thereby decreasing visual distortions and providing superior vision. The hybrid design also prevents dirt from getting under the lens and will not pop out unexpectedly. No other contact lens available today can provide all of these benefits in a single product, making hybrid lenses suitable for those suffering from keratoconus. Melbourne locals will find that help is only a call away with In2Eyes! Synergeyes have a lot of helpful information on their websiteas well as videos on hybrid contact lens care, insertion and removal. You can watch some of these videos below.